Unfortunately it happens and it has to be dealt with quickly before the weather gets into the supporting structures. 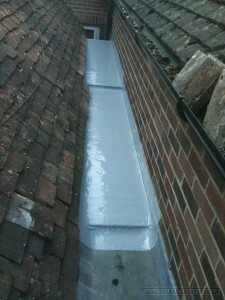 This gulley was lined in lead, it is on someone’s house in Wantage town centre Oxfordshire. The lead was stolen so I was asked by the clients insurance company to find an alternative to replacing the lead. I advised on a Sealoflex system as this adheres to almost any substrate. I started by removing the bottom three course of tiles to expose the gulley. I cleaned the gulley and found the boards to be in sound condition. I then applied the Sealoflex system onto the boards and up the brick work. Lets see if their sticky fingers steal this protection. Click to enlarge the image for more detail. This entry was posted in Leadwork, Roof Repairs and tagged gully lining, Sealoflex by admin. Bookmark the permalink.